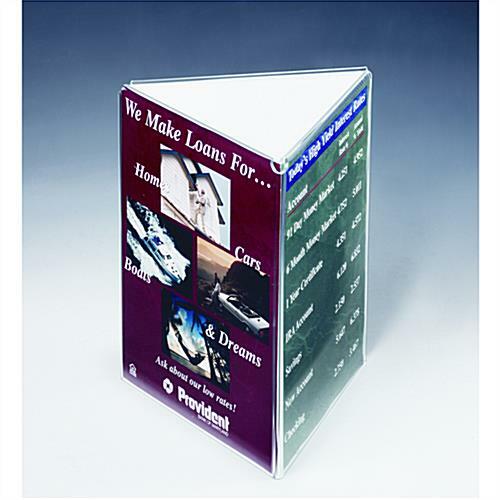 Menu Card Holder with Tri-Fold Design 4" x 9"
This menu card holder is a tri-fold frame with three acrylic fold-over panels for 4" wide by 9" high graphics. Each table tent can hold three different signs for maximum exposure. 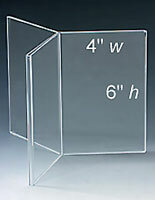 This menu card holder, also known as a sign frame, is made with clear acrylic. 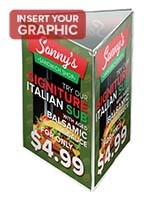 This design allows for an unobstructed view of the entire graphics or food listings. Place this menu card holder on a restaurant tabletop to advertise drink or dessert options, as well as seasonal promotions. 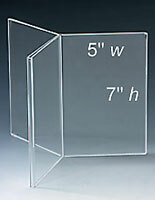 The 4" x 9" size is often used for take-out menus and other literature printed for restaurants. 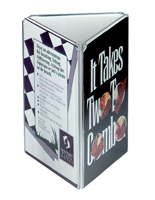 This table tent is the menu card holder preferred by most casual dining establishments. The center of the frame is hollow, allowing for placement of a condiment bottle or other essential items. 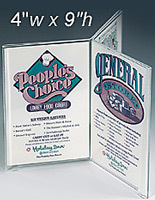 This menu card holder is also used in hotel rooms to display room service options, a TV channel guide, as well as important phone extensions. The bottom-loading design of this table tent allows for easy change-outs. Turn this menu card holder upside down, pull the old prints out and insert new graphics. Maintain this acrylic sign frame looking neat and clean with a damp rag and paper towel. 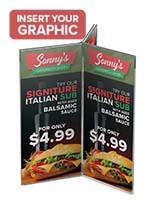 This menu card holder, tabletop advertising frame, is an effective tool used in most casual dining establishments to promote new items. 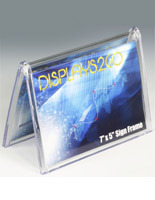 Place this tri-fold sign frame on every table to help boost sales and product awareness. 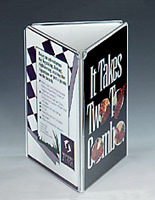 This menu card holder can be purchased in many other sizes and panel configurations on this site. Exactly the style I needed, excellent price, great quality. Great review, Lauren! Thanks for shopping with us.